The Pchain ICO is the first native multichain system in the world that supports Ethereum Virtual Machine (EVM), which consists of one main chain and multiple derived chains. It uses POS based multi layer sharding mechanism with a novel pipeline design that tremendously improves the performance of transactions. It uses a new Oracle mechanism, based on the knowledge graph which makes it easier to encapsulate smart contracts. W3C compliant smart data effectively adresses the issue of nonintelligence in smart contracts. The smart contracts of Pchain can be easily invoked with other non-native Tokens (BCH, ERC20) by using the provided toolkit with cross chain transactions. – Distributed artificial intelligence, distributed question, and answer, big data transaction. – Digital asset transaction, providing reliable records for digital asset transactions. – A game, rule set for the game to avoid cheating. – Notary system, provide the basis for a promise that cannot be tampered with. – Full cycle collaboration system, it works on the whole process, from planting and harvest all the way to supplychains and marketing. – Trackable social networking, recording all the words that have been said. 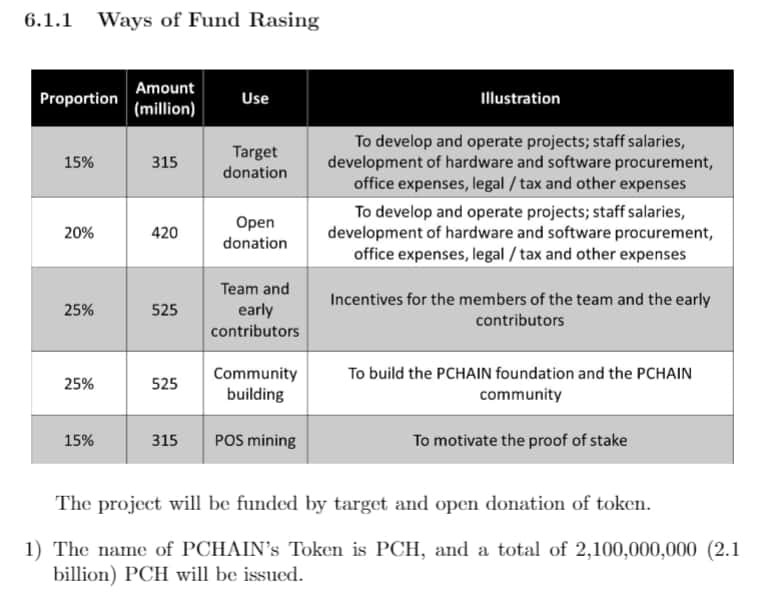 Pchain connects benefits of well-known projects like side-chains (rootstock), interoperability (polkadot, ark, cosmos) and sharding (zilliqa) and puts them into one project making large-scale blockchain applications possible. Pretty fancy stuff if you ask me! Little is known as of yet with regards to the token economies. What we do know is that Pre-Sale is currently taking place, so if you want a piece of this Pchain shaped pie, it’s minimum contribution is 300ETH and a max of 4000ETH. The hard cap is 50,000ETH and it’s not been made clear if Pre-Sale investors could (if popular) take all this allocation of their fund raising goals or if there has been a set allowence put aside for the community intrested in the ICO. Dewdrop Stage — T + 7 months Complete the development of Pchain core system which supports account system and deployment of smart contract, publish the technical white paper. Test net of the main chain online. River Stage — T + 12 months Publish the product on the major network complete document of external API and wiki. Sea Stage— T + 15 months Expand the capabilities of knowledge graph and Data Blockchain and support external development interfaces. Ocean stage — T + 18 months Introduce several blockchain application projects to form Knowledge Graph Blockchain Alliance. It’s a slightly confusing roadmap as they haven’t put any dates on their targets. I don’t know if this was a strategic move or if they just didn’t want people to have expectations of what they will achieve, either way, a bit more transparency would be well received. We do know that the Whitepaper was published on 1st March 2018 which would either put them at the initial stage or the Dewdrop stage. Still, a long way to go! We did find the above helpful breakdown of the token sale allocation, the wording is pretty tough which could be due to the language barrier. We noticed that 25% is allocated for the team & early contributors which we feel is pretty high considering only 20% has been allocated on developing the PCHAIN hardware & software procurement, office expenses, legal as well as Tax/other associated expenses. The CEO, Dr. Feng Cao was an early adopter & advocate of Cryptocurrency in China. He has a huge amount of experience and he was the inventor of the 1st International Blockchain patent from China, the Co-Founder of ChinaLedger and the most influential blockchain alliance of China. Feng has successfully accomplished the 1st blockchain based assets earning rights transfer in the world in September 2016, which is also the 1st Financial Blockchain Transaction in China. Pretty amazing achievements! To top things off he was the Ex-Chief Scientist of Internet Finance and cochair of the patent review board in IBM Research China, having worked for IBM for over 15 years! Despite having all these amazing accolades it would have been nice to have seen who their advisory team are, which are not listed on the website. The rest of the team all seem well rounded but it’s hard to say when you don’t know the Chinese market well enough.